Bella is a full sister to Ch. Wincroft the Verdict's In ("AIi"), the dam of our beautiful Bart, a/k/a BISS GCh. Oeste's Havnfun Playin an Outlaw. 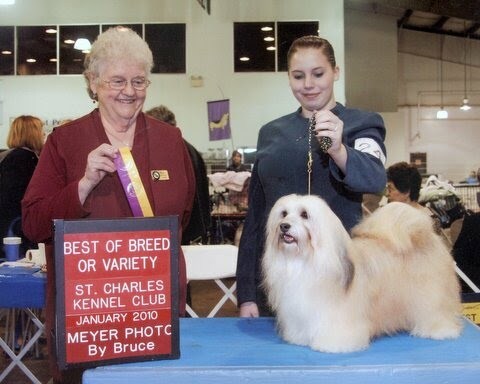 Bella's dam Aimee is from Mirabell & René Woudman's Mucho Bravo Havanese in the Netherlands. We loved sweet Bella from the moment we saw her in the show rings in California, shown by Shannon Stone. We are very pleased that the Johannes bred her to Bart, resulting in our G.Ch. Oeste's American Idol ("Carrie").